Many an upscale cocktail bar like to tout specialty drinks concocted with house-made vodka infusions. It’s not difficult to make vodka infusions at home, however, and it can be a hoot to experiment with different flavors. I recently bought some produce at the neighborhood farmers market, and the vendor thoughtfully gave me a bunch of lemon basil to try. It didn’t quite work with the roasted vegetables and sausage I made that evening, but the fresh herb sounded perfect for an infusion. Whatever they’re doing in their distillery, they’re doing it right. They manage to produce a smooth liquor for a surprisingly inexpensive price (though I have noticed unconscionable mark-ups in certain stores). You should be able to find a 1.75 liter bottle for about $20. Binny’s carries it at this price, which seems about right. 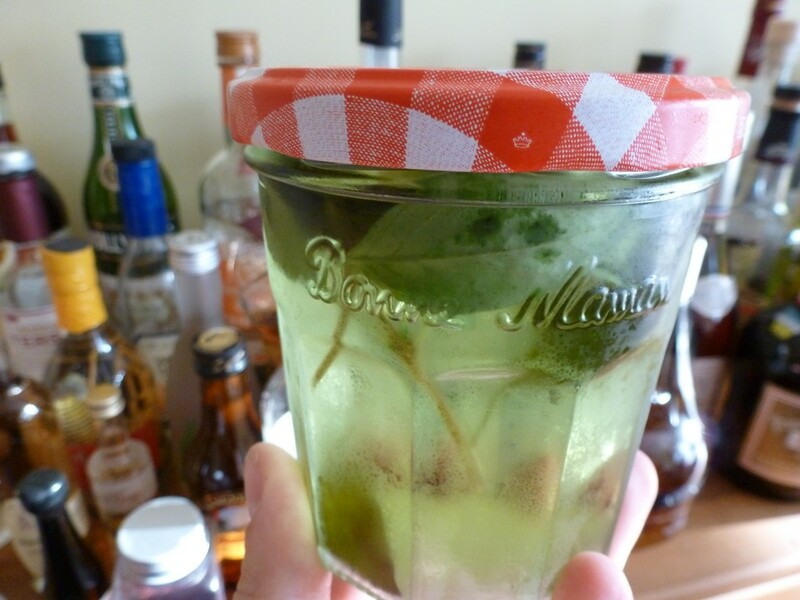 I washed a handful of the lemon basil leaves and tossed them in the jar, covered it tightly, gave it a shake and let it rest in the refrigerator for a couple weeks, during which time the vodka turned a pleasant light green. A recent dinner of chicken stir-fry with green beans, red peppers, onions, garlic, jalapeno, preserved lemon and soy sauce seemed like a perfect occasion to see how my lemon basil vodka turned out. Before making cocktails, I tried drinking it straight up. It tasted more like lemon than basil, but in any case it was a bit too strong for my taste without any mixers. Since I’m fond of making pineapple/basil cocktails (pineapple juice and vodka vigorously shaken with ice and fresh basil leaves), pineapple juice seemed a natural choice for a mixer. But even with two parts vodka and one part juice, the pineapple overwhelmed the subtle flavors of the lemon basil. This cocktail was nevertheless my favorite pairing with the spicy stir-fry; the cooling pineapple washed away the spiciness and prepared the palate for the next bite. In order to not overwhelm the lemon basil flavor, I simplified the cocktail as much as I could, using neutral club soda and a dash of simple syrup. A pretty pale green, it tasted wonderfully bright and refreshing, particularly on a warm summer evening. You can adjust the ratios to your taste, but one part vodka and three parts club soda suited my palate best. If you come across some lemon basil, I strongly recommend reserving some to make an infusion, but you can use regular basil, or lemons, or oranges, or raspberries, or whatever tickles your taste buds. If you search for “Vodka Infusions” on the Internet, you can find all sorts of tempting recipes. And if you use a small jar, you don’t have to commit an entire bottle of booze to the experiment. So get out there and soak something in vodka! And if you do, I would love to hear about it — please feel free to post a comment or two about your efforts. Cheers!